One of the CONCACAF Gold Cup semi-final matches will be taking place at the Rose Bowl this Sunday. Depending on the outcome of the quarterfinal games taking place on Thursday, the match-up will be between Jamaica, Canada, Mexico and Honduras. The Rose Bowl gates open at 4:30 p.m. and kick off will be at 5:30 p.m. 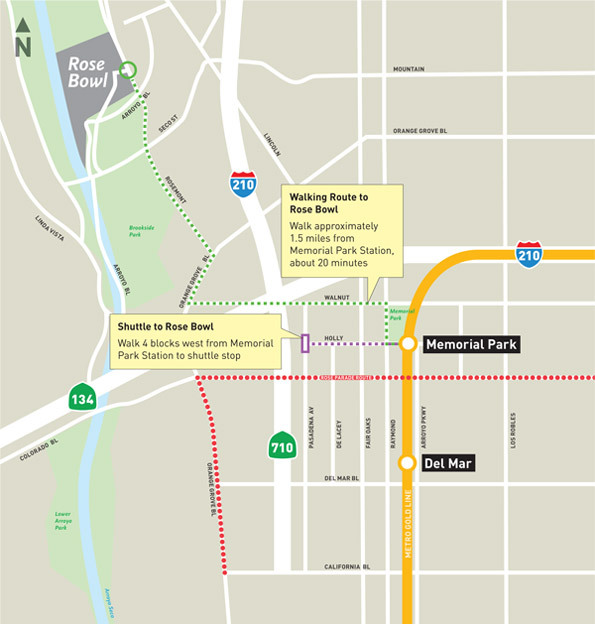 If you’re heading to the game, you can take the Gold Line to Memorial Park Station and walk about 5 minutes to the Parsons parking lot for the Rose Bowl shuttle. Please note the shuttle will NOT be free for this event: it’s $5 roundtrip if you pre-purchase tickets and $10 on event day. The shuttle will run between Parsons and Lot B at the Rose Bowl Stadium starting three hours before game time and ending one hour afterwards. You could also consider walking to the Rose Bowl from Memorial Park Station — the walk isn’t bad and is mostly shaded — or try Metro Bike Share. There’s a bike share kiosk across the street from Memorial Park Station and one located in Brookside Park. Finally, Bike SGV is providing free bike valet service for those who want to ride their own bikes. Strollers, scooters, skateboards and other mobility devices may also use the valet service. A one-way ride is $1.75 and comes with two hours of free transfers on TAP. A reusable TAP card costs $1. Avoid long return lines at TAP Vending Machines by loading your TAP card with $3.50 in stored value for a roundtrip in advance. If you’re looking to park and ride, you can park at Union Station for $8, or at many stations along the Gold Line. Some lots are free and some are paid, check this page for details. I took the Goldline from APU/Citrus to Pasadena for the U2 concert and it was definitely the way to go. Paid for the shuttle, but the line at Parson’s was crazy long, so we walked. Walking out of the Rose Bowl was waaay faster than taking the shuttle; I would recommend that as long as you don’t have an issue with a longer walk. I take the 605 north and use the Duarte station (free parking!). Getting into Pasadena is a breeze. The shuttles are very nice but while the ride there is quick, the ride back is incredibly slow because everyone exits the venue at once and it creates a bottleneck. Last time I waited at least an hour to board the return shuttle plus another 20 in downtown traffic. I would definitely recommend you walk back. I have no doubt that Mexico will win their Quarterfinal so this match will essentially be a “Home Game” for them. Should be fun!